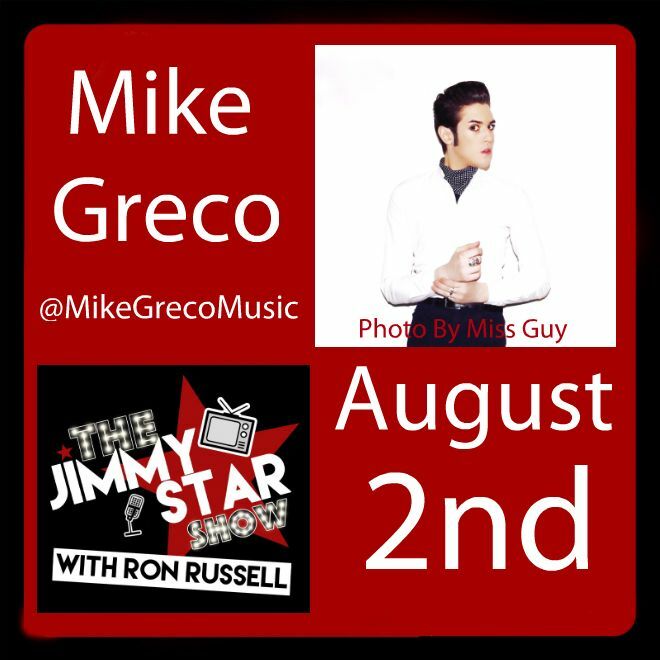 NEW YORK - July 27, 2017 - PRLog -- Mike Greco will be a featured guest on The Jimmy Star Show live radio/tv show hosted by King of Cool Jimmy Star along with Cool Man About Town Ron Russell to discuss his new EP "No Rules About It," his career and the entertainment industries at large. The Jimmy Star Show is tv/radio's coolest hit show, featuring the coolest in music, entertainment, fashion and pop culture, all from a fun industry insider perspective in a completely live, unedited fast-paced two-hour conversational format. Mike Greco is a singer/songwriter and multi-instrumentalist based in New York City. He began his professional career in 2010 as a session and touring musician, sharing stages with artists such as Cheap Trick, Ace Frehley, The Dirty Pearls, Cherrie Currie (The Runaways), Miss Guy (The Toilet Boys), Randy Jones (The Village People), and Tavares. Growing up in Valley Stream, Long Island, Greco had an affinity for music through family blood. Father and uncle were rock musicians, and his grandfather, a big-band leader. There definitely wasn't a shortage of musical inspiration. Learning to sing and play piano at the age of four, Greco would eventually study both classical and jazz, while pursuing alternative genres on his own time. As a young adult, Greco became fascinated with Rock, Jazz Fusion and R&B as well as keyboard and music technology. This prompted his move to New York City to attend The New School for Jazz and Contemporary Music. Here he studied under and worked alongside famed Jazz musicians Bill Kirchner, David Schnitter, Adam Holzman, Rachel Z, Michael Wolff and the world's most recorded drummer, the legendary Bernard "Pretty" Purdie. During his time living in Manhattan, Greco has been fortunate enough to expand his networks into the city's infamous nightlife scene. Here his creative and professional bedfellows have included amazingly talented innovators such as fashion/nightlife impresario Susanne Bartsch, Jazz trumpeter and bandleader Brian Newman, queer/trans idol Amanda Lepore, vocalist/songwriter Justin Tranter, and punk pioneers Blondie, fronted by the iconic Deborah Harry. 2016 was a landmark year for Greco. He began a relationship with Marymount College as adjunct faculty, co-piloting the school's first Pop/Rock performance class. He also recorded and released his debut EP of original music entitled No Rules About It, produced by Matt Katz-Bohen (Blondie), engineered and mixed by Jamie Siegel (Sting, Whitney Houston). The Jimmy Star Show with Ron Russell is pleased to showcase the expertise and talent of Mike Greco and all anticipate a fun and informative time talking with him about his career and the entertainment industries at large. Join King of Cool Jimmy Star, and Cool Man about Town Ron Russell as they have a playful and sometimes wild time with the talented featured guest! To hear/watch Mike Greco live on The Jimmy Star Show tune in to W4CY Radio on Wednesday August 2nd, 2017 from 3-5 pm ET and 12-2 pm PT online at www.w4cy.com from anywhere in the world!